Eclipses are considered as the most fascinating natural phenomena we can observe to the naked eye. On January 21, 2019, around 5:12 am UTC, the moon will pass across the Earth’s shadow for about 1 hour and 2 minutes, a bit shorter than the previous total lunar eclipse that happened on July 27, 2018 but still exceptional! This total lunar eclipse will be the last one visible until May 2022! When and how to observe it? Why does the moon shift its color to orange-red during an eclipse? How to photograph it? Find out in this article all the information that will help you to better understand this rare phenomenon occurring on January, 21st 2019 before dawn. A solar eclipse: it occurs when the Sun, the Moon and the Earth are perfectly aligned according to this order. The sun is then more or less covered by the lunar disk. 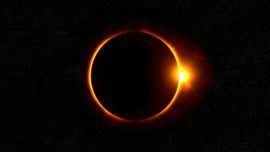 Solar eclipses can be divided into 4 other types, in respect to the alignment of these three bodies: total eclipse, annular eclipse, partial and hybrid. 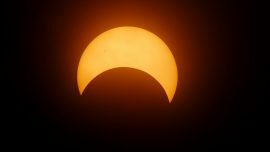 The most astonishing eclipse as we imagine is obviously the total eclipse, when the moon covers entirely the solar disk. Actually, the Earth-Moon distance is 400 times shorter than the Earth-Sun distance but the diameter of the Moon is also 400 times shorter than the sun’s diameter. Thus, the apparent size (apparent diameter) of the Moon is similar or even identical to the apparent size of the Sun as seen from an observer on the ground. A lunar eclipse: it happens when the Moon is not this time located in front of the Earth but behind it. 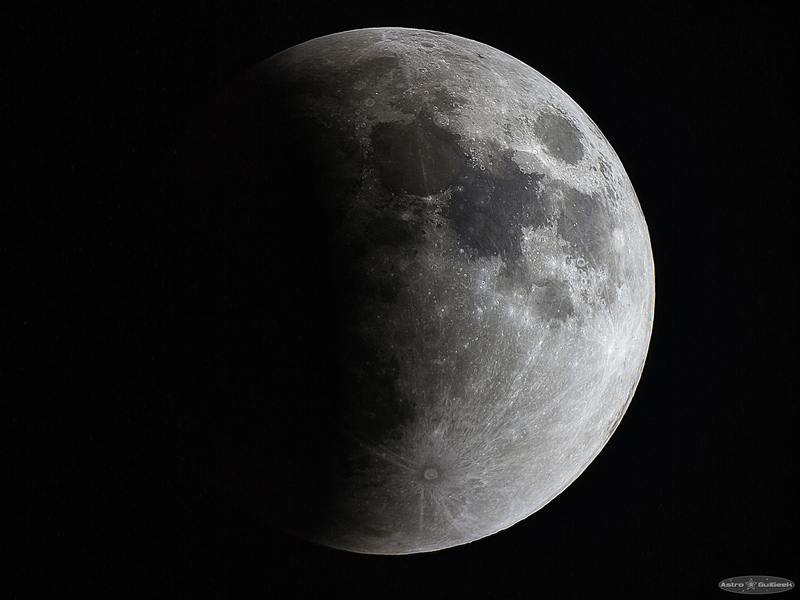 The Moon is then eclipsed by the Earth’s shadow. In contrast to a solar eclipse, an eclipse of the Moon can be easily observed and is harmless for our eyes. Eclipses, whether they are solar or lunar, occurs at a specific moment of the day. If we look at the Earth-Moon-Sun configuration, we notice that a lunar eclipse will only be visible during the night whereas a solar eclipse can only be spotted at daylight. Moreover, a lunar eclipse can only happen at a full moon phase because it is when the Sun, the Earth and the Moon are closest to an alignment. However there are not always perfectly aligned otherwise there will be a lunar eclipse every full moon, every month. At least, two is the minimum number of lunar eclipses estimated to occur each year. The total eclipses are the rarest and they do not occur every year. 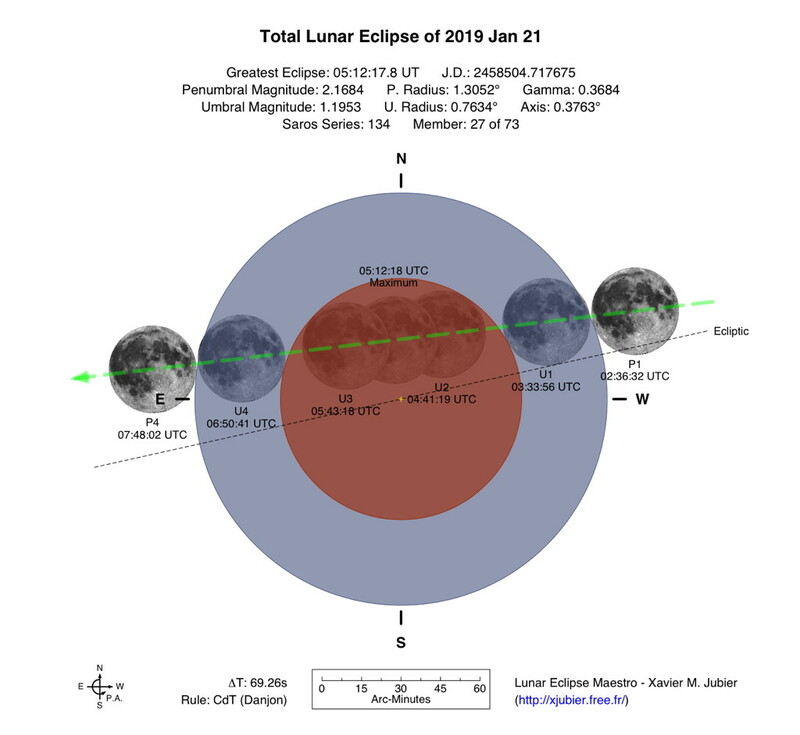 Penumbral lunar eclipses: the moon stays only in the penumbral part of the Earth, but it is difficult to notice a strong difference of brightness in comparison of a traditional full moon. 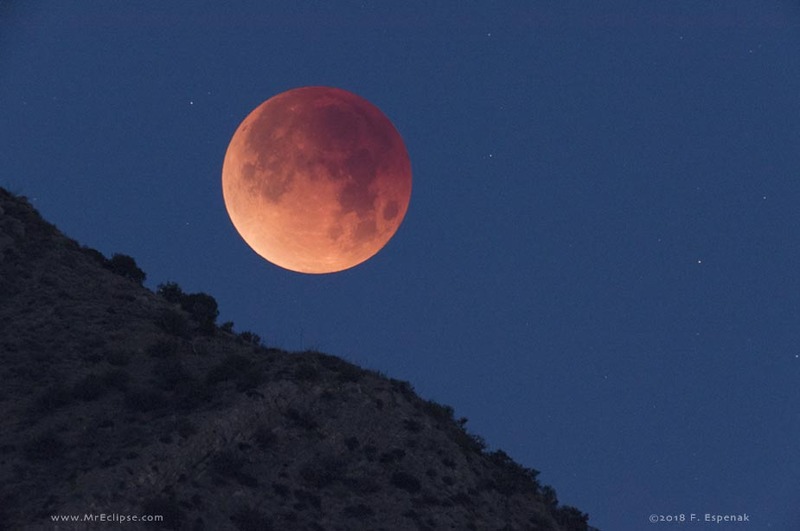 Partial lunar eclipse before totality, September 28 2015. Credit: Guillaume D.
Partial lunar eclipses: a part of the moon is fading in the Earth’s shadow. Visually, this phenomenon produces a side of the moon totally black whereas the other side is still illuminated direly by the sun. Such an eclipse could be considered as moon phase changing within hours. Except that during an eclipse, the moon is perfectly full. Total lunar eclipses: the whole disk of the moon dives in the Earth’s shadow or ‘umbra’. The moon is not completely black but reflect an intense and peculiar orange color, visible to the naked eye. The brightness of the Moon is so low that stars at the background are even visible! You can find an explanation of why the moon has this color below. A total eclipse is not instantaneous. In other words, in order the whole surface of the Moon to cross the Earth’s shadow, there must be a series of phases in which the Umbra shades progressively the Moon until it reaches the lowest brightness. 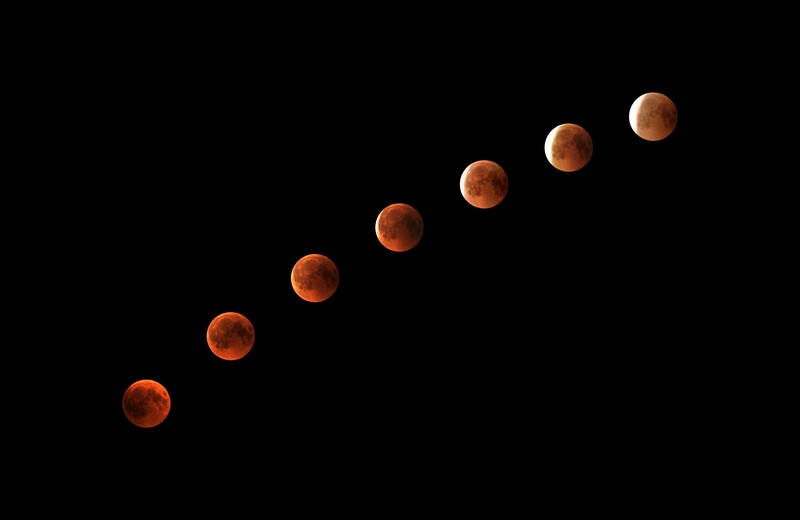 These phases or steps are actually corresponding to the 3 types of lunar eclipses already mentioned: the Moon first goes into the penumbra (penumbral eclipse) than shades slowly in the Earth’s shadow (partial eclipse) and finally becomes entirely hidden in the Umbra (total eclipse). 2:36 am UTC: Beginning of the penumbral eclipse. The Earth’s penumbra reaches the surface of the Moon. A this time, the eclipse only starts faintly and gently because the brightness of our satellite is almost imperceptible to the naked eye. A picture could possibly make you notice the behavior of a darker zone onto the moon. 3:33 am UTC: Beginning of the partial eclipse. The Moon enters into the umbra cone of our planet. From this step, the eclipse starts to be an interesting target to human eyes. 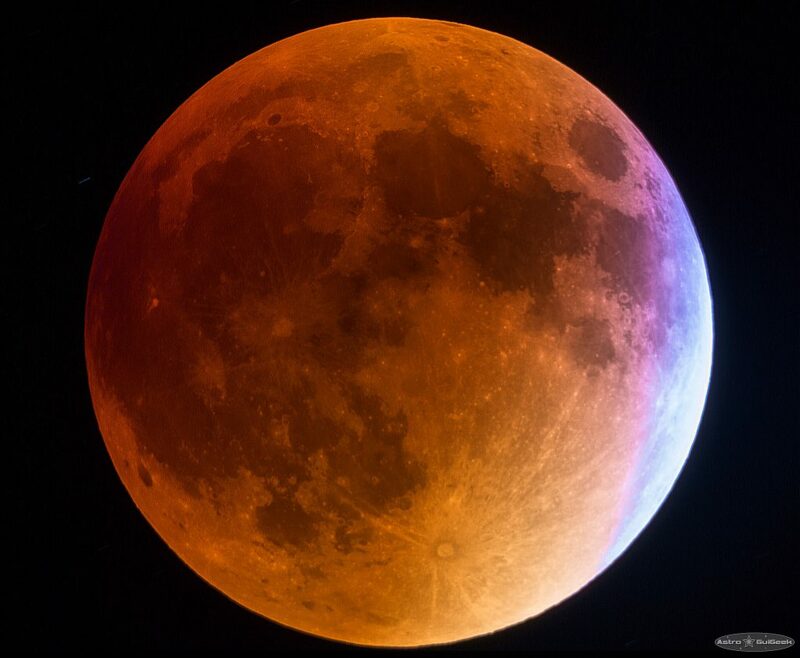 A part of the moon gets darker and larger, until the full moon is tinted of orange-red. 4:41 am UTC: Beginning of the total lunar eclipse. The moon is fading out and appears orange. On regular basis, the moonlight disables us to observer the dimmest stars of the sky. However, from 4:41 am and thanks to this eclipse, you will be able to do a bit of stargazing without the bright light of a full moon making you blind. A magical moment whose countdown is set to a hour. 5:12 am UTC: Maximum of the total eclipse. It is at this moment that the Moon reaches its minimum brightness in the sky and its strongest coppery hue. 5:43 am UTC: End of the total eclipse. Beginning of the partial eclipse. The Moon loses its coppery color in order to become gradually white. The Moon is still in the shadow of the Earth but recovers its usual brightness and color. 6:50 am UTC: End of the partial eclipse. Beginning of the penumbral eclipse. The moon looks like a typical full moon. 7:48 am UTC: End of the penumbral eclipse. This is the official end of the total lunar eclipse. Keep in mind that depending on your location, the end of the eclipse might not be visible because of the moonset. Why is the Moon orange during a total eclipse? During an eclipse, we saw that the shadow of our planet is projected onto the surface of the Moon. This shadow would be completely black if the Earth did not have any atmosphere. In fact, the edge of the Earth is marked out by our atmosphere. The light coming from the Sun is absorbed by a thick atmospheric layer composed of particles of air, water and more. Because these particles scatter blue light, they absorb this color from the sunlight to let the others escaping as a filter. The result is that if you remove the blue color, you get a rather orange hue. Blue and purple strips caused by ozone atmospheric scattering. Credit: Guillaume D.
The Moon gets this tint more or less accentuated according to the thickness and the density of the atmosphere at the moment of the eclipse. Moreover, as the atmospheric layers don’t have the same composition, it is even possible to see other grading colors right before or right after the totality. The image above shows blue and purple strips on one side of the moon caused by the light absorption taking place in the ozone layer. How to observe and capture the total eclipse? 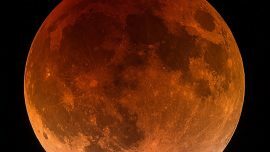 A total lunar eclipse can be observed without any protection, since it is simply a full moon plunged into the shadow of the Earth. Consequently, there is no risk to harm our eyes, unlike solar eclipses which require the use of suitable filters. Thus, a lunar eclipse can be observed with the naked eye, as well as with a pair of binoculars, a refractor or a telescope. There is not a method of observation better than others. For example, looking at the total eclipse with our own eyes lets us see the stars in the background sky as the moon is getting into the shadow. Of course, you will also be able to see the orange color of the moon. In another way, a telescope allows you to admire in detail the surface of the moon entirely tinged with shades of orange and red. If you have a wide angle camera (no zoom), you will not be able to get a close-up view of the moon. However, you will have the opportunity to capture the landscape surrounding the moon: starry sky and landscapes in the foreground. A tripod is highly recommended to stabilize your camera in order to take long exposure pictures. If you have a camera with a zoom lens (200mm, 300mm … etc), you can get amazing close-up views of the moon. You will also need a tripod. The most important thing is to manually choose a short exposure time to avoid having motion blur caused by the motion of the moon and the Earth. Typically, an exposure time of less than 2 seconds with a zoom lens of 300 mm should be a good showcase. If you have a telescope –reflector or refractor– you can try to photograph the eclipse by sticking your phone’s camera to the eyepiece. This is a technique used by amateur astronomers who want to try astrophotography, but don’t have the appropriate equipment yet. Be careful not to move the telescope while shooting! For the next eclipses, the Stellina telescope will be an ideal solution to capture these moments, thanks to its integrated sensor and automated mode. You are now ready to attend the total lunar eclipse of January 21! Feel free to share with us your most beautiful pictures of this event. They might be selected to appear in a special dedicated article on our website.